How do I delete recurring shifts? If the icon is present, click on the first shift in the series you want to remove to open the shift details window. Whichever shift you choose will delete that particular shift and any future shifts in the recurrence, but not past shifts. In the popup window, click the trashcan icon. Next, you will get a prompt asking if the change applies to only this shift or all future shifts. Choose all future shifts, and they will all be removed. 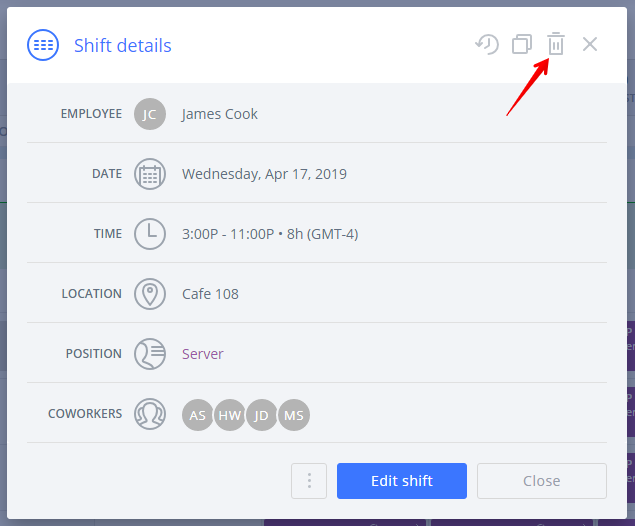 If you're not seeing the recurrence icon, then you will need to delete your shifts manually (this can happen if an employee has been deleted or deactivated and their shifts were made unassigned or available). 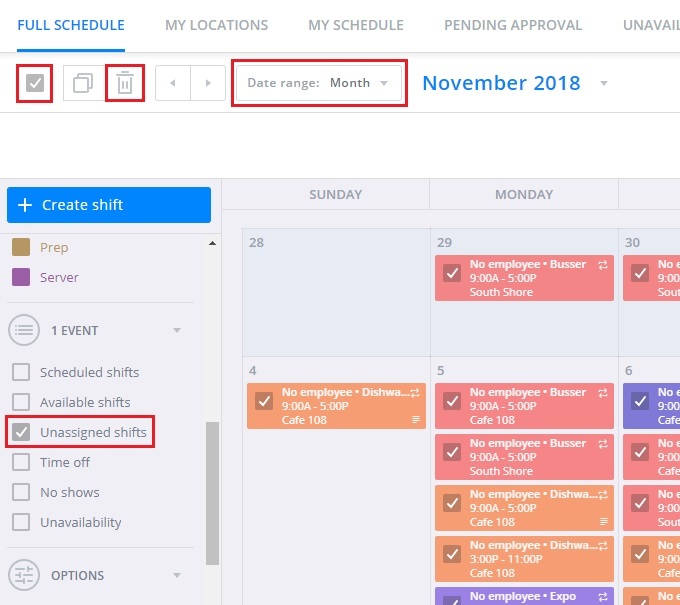 Switch to the Month view and filter just unassigned or available shifts into view. Then, click Select all (checkbox at top left), which will make a trash can icon appear. Click it and all the unassigned shifts will be removed. If you have any shifts you want to keep, you can deselect some or use locations or positions to single out just the ones you want to remove. You'll have to repeat those steps for each future month (use the arrows next to the month name to switch views) in which the unassigned shifts appear. Premium and Business accounts can also apply the custom range to remove up to 120 days at once. To avoid this in the future, we recommend deleting shifts any time a user is deleted or deactivated and re-creating the recurrence, instead.